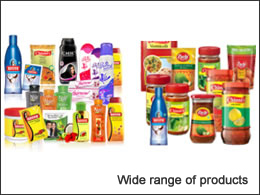 Lotte Foods India Pvt. 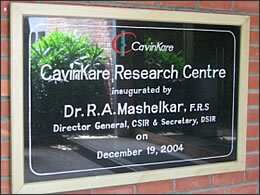 Ltd.
Our team had the opportunity to visit CavinKare Research Center (CRC) located in Chennai, Tamil Nadu state, in India. 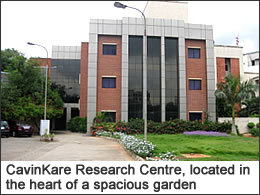 CavinKare is a company that researches and manufactures various products such as hair care items, achaar (Indian pickles), and beverages. 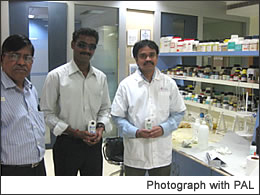 Dr. T. Muthumani took us around their quality control lab. They currently use our PAL series as their main model. Their samples consist of mostly fruit juices, such as mango or apple, and they take measurements for both raw material and the final product. They had a question ready for us as soon as we arrived in the QC Lab. "It seems that the readings are unstable…"
When we took a look at the PAL that they were using, we saw that the prism was not completely clean. To take accurate measurements, it is very important that users keep the prism clean and undamaged. Oftentimes some residue of a sample is left on the prism, especially when multiple measurements are taken consecutively, but unless a sample is completely cleaned off, you cannot take an accurate measurement of the sample that follows. What do you do for daily cleaning of the prism? We clean it with water and then wipe it off. Water is okay as long as it is cleaned off thoroughly, but alcohol will take away any tough or oily residue, therefore we recommend alcohol. Our staff demonstrated this by cleaning their PAL prism using alcohol, and then testing it out. We took several measurements, and they were very stable and accurate. All of their staff including Mr. Muthumani were very pleased with the result. For samples that had a lot of pulp, we asked them filter it once, extracting out the juice. This also gave us accurate and stable measurements, proving to us that there was no problem with the unit. ATAGO India has an office in Chennai. If you have any more questions about our products, please feel free to contact us any time.